A pantry staple for most of us, balsamic vinegar. Somehow the color, the taste and even the name make this vinegar a favorite for splashing over fresh summer salads. If you’ve recently started with the Paleo lifestyle you may be wondering about vinegar, and specifically balsamic vinegar. Is it worthy of Paleo status or should we be throwing it in the rubbish. There is a reason we love this vinegar so much and it probably has a lot to do with its country of origin, Italy. Authentic aceto balsamico di Modena can only be produced in Modena and Reggio in Italy. In terms of its history we can trace balsamic vinegar back to 1046 when a bottle was given to Emperor Enrico III of Franconia as a gift (1). Interestingly, vinegar as we know it today was not used in food, instead it had many uses including disinfectant uses, sore throats, labor pains etc. If we look at the meaning of the name for this vinegar it explains a lot, in that the Italian word balsamico comes from the root of balsamo, in english- balm. Balm being defined as a healing ointment or soothing restorative agent (2). 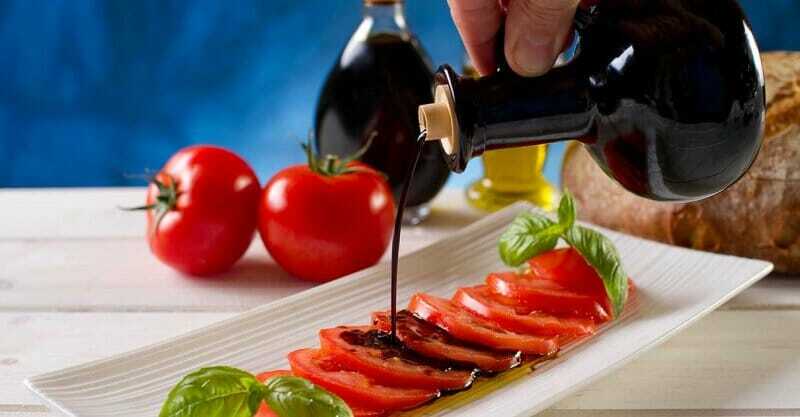 What most of us don’t know is that only balsamic vinegar produced in this way is called tradizionale (italian). So most of the time what we buy in the supermarket is ordinary white whine vinegar with caramel coloring added. To ensure that you are buying the best quality product have a look at the ingredients list. The very first ingredient (which always signifies the largest quantity) should say grapes, and not vinegar. You should also not find caramel or any other colorant or flavorant in the ingredients list (4). Next up look for the bottle that says aged in wooden barrels, as sometime the label will say aged in wood which, via a technicality this only means that wooden chips were added to the vinegar as it aged. Lastly the price point is always a fair indication. It goes without saying that you get what you pay for as aceto balsamico tradizionale will be sold for a few hundred dollars per liter. Disappointing I know. There is also a third version of this vinegar, it will still be a pure vinegar product in terms of the ingredients list and it will still come from Modena, only the aging process will not be as long. This product is superior to the very cheap options available so be aware (5). Let’s clarify. Technically speaking no vinegar would be Paleo by virtue of the fact that our Paleolithic ancestors would not have had the knowledge to ferment grapes into wine. Secondly, vinegar is essentially a processed product as the ingredients have undergone a chemical transformation. But, vinegar belongs to the group of foods we put into a grey area. For most of us vinegar has a neutral effect on us, that is to say we do not suffer in any way from consuming it in moderate amounts. In fact, vinegar actually has a few positive health benefits and can be consumed happily and healthily as part of an ongoing Paleo lifestyle. Just don’t have it with bread. Yes, this will always be an advantage. Aside from the fact that most of us won’t be using much of the stuff, it is a definite plus that vinegar only contains 5 calories per teaspoon used (6). Various studies in rats have shown that consumption of vinegar can lower both cholesterol as well as triglyceride levels (9). Unfortunately these benefits have as such not been found in human studies aside from one study who showed that women who regularly ate their salads with vinegar had a reduced risk of heart disease (10) . This study however, is not enough to make a conclusive claim about this benefit in humans. We wouldn’t recommend using pricey balsamic vinegar for cleaning your dentures however when any old vinegar will do. Try this crunchy green bean salad made with beautiful balsamic vinegar here at Paleo Grubs.